Since 2004 We are selling this product without any significant problems. Grass, forest meadows, horse meadows are mowed without problems. 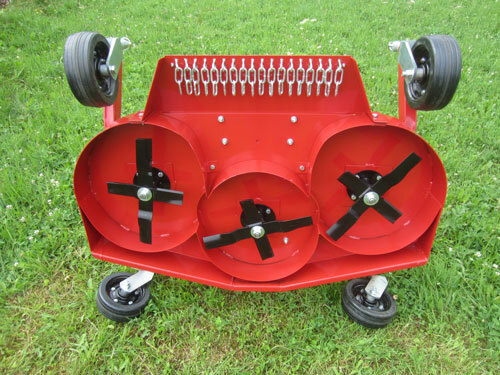 The tractor should have a rear three-point hitch KATI or KATII and a standard PTO 540U/min. clockwise. 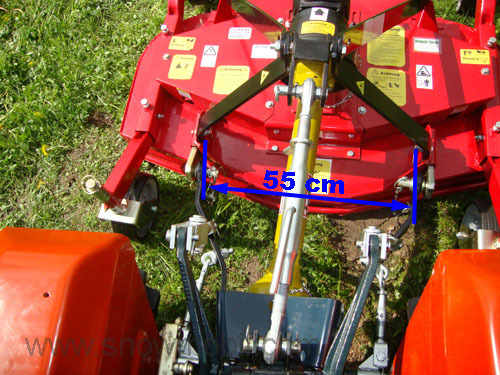 The lower linkage holder can be adjusted 1 x at 55 cm or 74 cm by turning them. The blades are screwed with 2 screws on the cutter shaft. The blades are made very solid. The material thickness is 6 mm - a normal lawn mower blade is only 4 mm thick. Due to the 6 knives/blades a very clean cut is achieved and the grass is particularly finely chopped. The blades are held by a large nut - with a stone impactthe blade can rotate / slipping, so the blade shaft and blade is protected. The crop is cut into pieces and thrown out by the rear ejector. 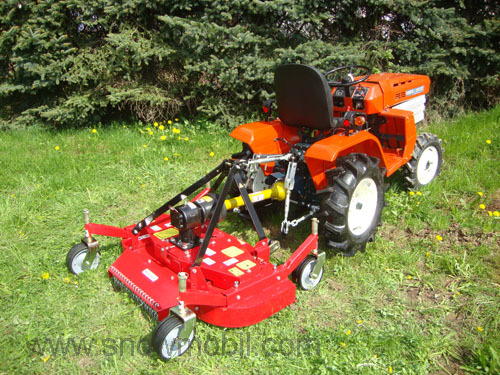 Ideal for recut and meadow mowing. The technical highlight is the very generously sized ejection chute. With a cutting width of 100cm the chute is 52cm wide inside so the crop can be passed outside immediately without any risk of blockage. A proven product at a fair price! The swiveling wheels are greasable. By means of the intermediate pieces you can adjust the cutting height. If the lower linkage bracket been rotated, the distance center to center is: 74 cm. The mulch sheets are screwed, you can unscrew the mulch sheet in ejection area depending on requirements. 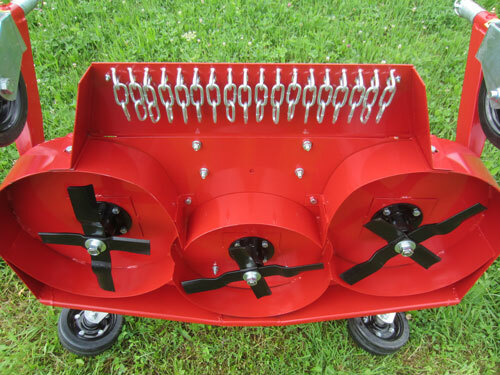 Here you see the additionally installed mulching blades. The blade trestles and blade shafts have been fundamentally changed regarding the standard design. This means that the blade shafts have been extended to make room for the second blade. 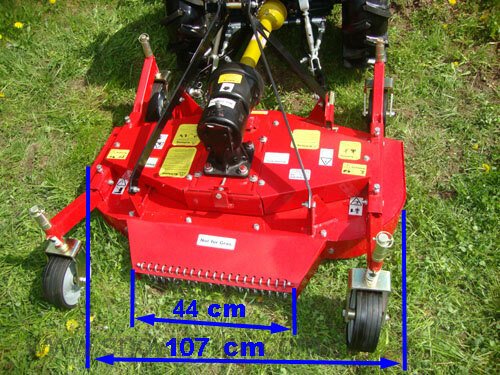 To install the additional mulching blades in the old version is thus not possible. 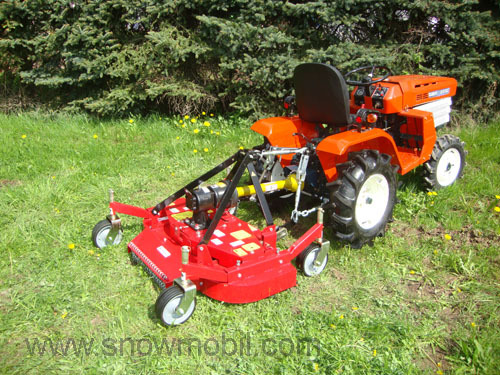 With the additional built-in blades, the grass is chopped finely. 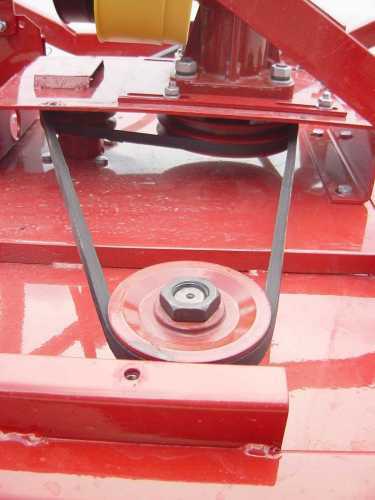 The power transmission to the blades is via belt. 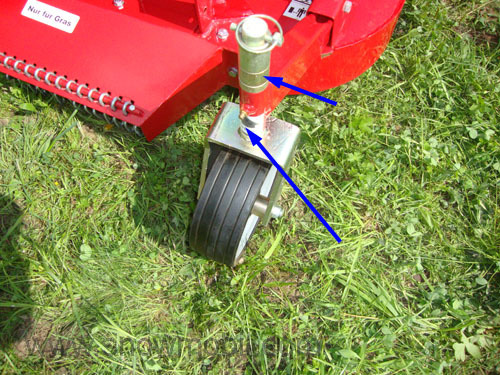 With rocks or other obstacles the blade shaft with the fan belt disc slips - so the mower works almost wear-free. 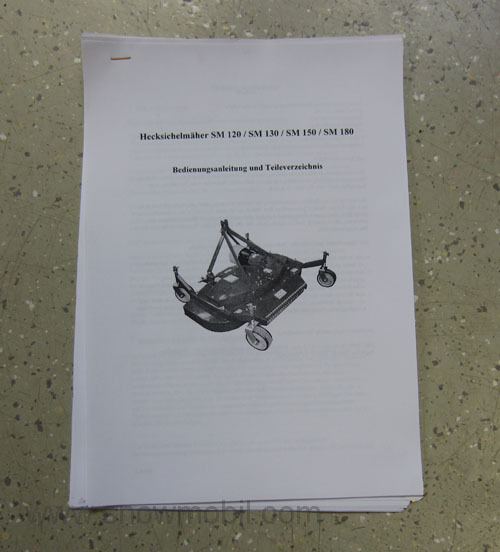 With manual including parts list and attached safty stickers!